Activist Kenny Bruno thinks he has a plan to destroy Exxon. In a January 2016 meeting attended by fellow activists and heavyweight trial lawyers like Matt Pawa, who last year extracted a $236 million verdict from the oil giant, the veteran environmental crusader laid out his precisely-crafted mission to starve the $365 billion company of resources, influence, and ultimately, any meaningful hope for profits. I can’t think of a bigger mistake. A coalition of 17 (and counting) State Attorneys General is taking their vendetta back to the 1970s, challenging Exxon’s knowledge of climate science and the impacts of burning fossil fuels. At stake is whether the company a) actually knows what it is talking about and b) is culpable. For years I’ve been hard pressed to think of a more demonized industry. Until Bruno came along, big energy was just a recreational target for fringe activists with a proverbial axe to grind. But, now the social meme has turned from merely one of casual dislike to pure hatred. As usual, though, there’s a silver lining in all this and it’s one that not one in a million investors understands – but should. The data show very clearly that it pays to ally yourselves with companies under siege, not run from them for reasons I’ll explain in a minute. Let’s return to Altria for a minute. Philip Morris USA, the largest tobacco company in the U.S., controlling half of the country’s cigarette market share. U.S. Smokeless Tobacco Company, which manufactures and markets smokeless tobacco products. You couldn’t turn around without seeing something against smoking. Yet Altria didn’t just survive bad publicity and multiple lawsuits-it thrived – and savvy shareholders who bought in as I suggested made bank. Activists, you see, rarely understand the concept of resiliency. What I mean by that is that they become so singularly focused on their agenda that they perpetually misjudge a company’s will to survive. Sure, they get their show trials and, as part of that, big payments and reparations if they’re lucky. But, ultimately, public shaming never works on anything other than a short-term basis. Demand simply shifts, the activists achieve a moment of glory, the lawyers make a ton of money and profits continue to roll in. I recommended Altria because I knew my history – social shaming ultimately fails, blame shifts to consumers, and demand continues unabated – and I believed that Altria’s management knew how to court the investors who would make that possible. 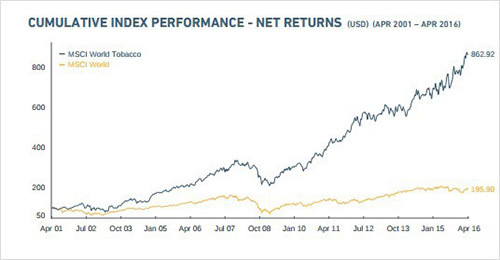 Altria has increased dividends every year since 1970 with only two exceptions in 2007 and 2008 respectively. That makes it a “must-have” for millions of income-starved investors at a time when they desperately want yield no matter how it’s generated. 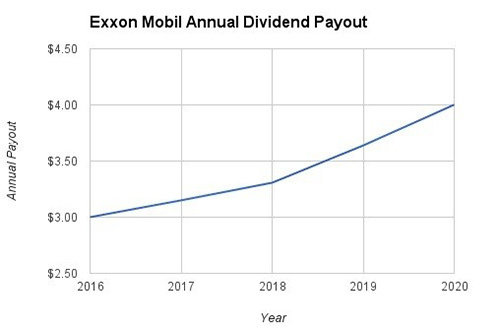 The company has paid more than $1 billion in dividends in Q1/2016 alone, and plans to reward shareholders with a payout ratio target of 80% of adjusted diluted EPS. Factoring in double-digit earnings growth year over year, this works out to a dividend boost this year of around 8% at a time when the Fed is squabbling about 0.25%-0.5% and the ten year treasury yield representing the so-called “risk free rate” is stuck at 1.71%. The company has a powerful investment base, is a Dividend Aristocrat – meaning it’s been increasing dividends consecutively for more than 25 years – and makes a product the world has to have. That translates into an effective yield of 4.4% for investors who take a far-sighted view on Exxon and make their move today while also representing a yield that’s more than double that of the average S&P 500 company. Exxon rolled out six acquisition and development projects in 2015 along that together would bring in an extra 300,000 barrels of production per day – hardly the behavior of a company that’s truly spooked by activists or even low oil prices. Which is why I’m counting on chaos in the energy sector. This was a really informative piece of information, one much needed when all I read about is dire doomsday forecasts. Thanks for the kind words Gilbert! Stories like this one are always interesting to write because the data is rarely what you would expect let alone associate with opportunity. I agree with our comment on EXXON. Trial lawyers are the “bed-bugs” of our democracy. They siphon out billions from investment and job creation, thus they become enemy no. 1 for middle class Americans who desire a good job and to raise their kids in a comfortable manner with higher education– including college. So, in the style of Bolsheviks, these sucker lawyers wish to make all poor yet they keep billions thru litigation. Don’t worry, we citizens, know what to do to remedy this abuse of laws. Thanks for the kind words and for sharing your perspective Swapan. It’s this kind of exchange that makes Total Wealth such a great place to be. My grandfather used to say that all the time and it’s a favorite expression of mine, too…very true in this instance! Very interested in both the Exxon and $1 stock. How do I move forward as I’m not an avid investor. Hello Mike and thank you! Exxon is pretty straight forward but I am unclear which $1 stock you are referring to. The best place to start is with our Free Special Reports (assuming I’m thinking about the one that’s featured there like you are). Glad you talked about oil company stock again. I have a question sort of related to oil recovery. Do you think RSX could be another good buy at this point? Russia has been hit severely due to oil price drop. Now since its price is going up, do you think it would rise ? Thank you – it was a fun article to write. To your point on Russia, I think that the country has it’s share of problems and, in keeping with several of our Total Wealth Principles, a great buy when it comes to the must-haves there. Oil is clearly key. If you’ve got the expertise, I think picking specific companies is better than RSX because you can focus. That said, I don’t think RSX is a bad choice at all for any investor simply wanting the exposure. As always, mind the risk carefully. As the only physician like myself with preventive, occupational and environmental medicine, toxicology, industrial hygiene and epidemiology with many other specialties, before I left Exxon as their flagship chemicals and plastics plants medical director, I did an extensive review of the literature on global warming and saw absolutely no causal association with petrochemicals. Did I mention that my passion is preventive environmental population medicine? I own no Exxon stock, but when I make a determination of that magnitude, swaying my opinion is near impossible. Exxon always acted on assessments and recommendations of the best and the brightest professionals. What else would you expect from the greatest company in the world? Thanks for taking the time to write in with what is obviously a highly personal and highly educated perspective. Not only do I appreciate it, but your thoughts are valuable to the entire Total Wealth Family and help make Total Wealth such a great place to be! Could you give me your thoughts on selling about 500 shares of BHP Billiton. It might be several years before it climbs back up. Take my losses now, and get into something with more immediate potential?